After four straight key wins, VCU will look to avoid a banana peel loss when traveling to DC today to face a George Washington team the Rams beat by 30 points earlier this season. The black and gold throttled the Colonials in their last meeting in one of VCU’s most complete performances of the year and have won their last three contests against GW, including a tough 69-65 road win last season. A road win tonight would keep VCU tied atop the A-10 standings with a Dayton team VCU defeated during their current four-game streak. It’s been a bumpy start to the Maurice Joseph era at GW. After going 8-5 in the non-conference, George Washington is off to a 4-6 A-10 start, placing them in the bottom half of the conference for the first time since the 2012-13 season. Joseph inherited a team from former head coach Mike Lonergan that lost three key seniors, but one that returned an all-conference player in Tyler Cavanough. Cavanaugh has been good but has seen his percentages dip while being forced to carry a team adjusting to so many new faces. The senior big has taken 30% of GW’s shots in A-10 play, tops among all Atlantic 10 players and is now captaining a Colonials offense that has gone from the nation’s 29th most efficient offense last season to one ranked 114th this year. GW’s biggest offensive struggles have come in finishing inside the arc, finishing just 44.8% of their field goals inside the three-point line, ranking GW 317th nationally in offensive two-point percentage. But as worrisome as the offensive dip has been for the Colonial faithful, it’s the lack in defensive production that will likely keep GW from any type of postseason appearance. GW ranks 12th in conference play in defensive efficiency and went from a top-100 caliber (No.104 nationally) D this past year to ranked 217th a season later. Those defensive deficiencies were on full display in VCU’s 85-55 win against GW early in Atlantic 10 play. Player to watch: Harvard transfer, Patrick Steeves. The 6’8 forward was a non-factor in VCU’s early win over GW, seeing just two minutes of action. Steves however has seen his role increase over GW’s last four contests, playing a season-high 33 minutes in a road loss at Richmond. Steeves has scored in double-figures in three of his last six contests and is finishing 64% of his twos in A-10 play, giving GW a threat in an area that statistically has been a weakness all season. The Rams continue to build a resume they hope will prove worthy of an NCAA at-large bid (should they need it) come March while also fighting for a second consecutive Atlantic 10 regular season title. VCU’s last four wins all came against teams currently within the top-six of the Atlantic 10 standings including two head-to-head tie-breaker Ws against St. Bonaventure and La Salle in the only games they’ll play against each other this regular season. The Rams have been one of the A-10’s most balanced teams in conference play, being one of just two teams to rank in the top-three in both offensive and defensive efficiency. Will Wade however recently expressed a desire to see that balance travel with the Rams, as VCU hasn’t quite been the same team in conference road games this season. The Rams however are 3-2 on the road and with a road win tonight would tie Rhode Island for the best A-10 conference road record so far this season. 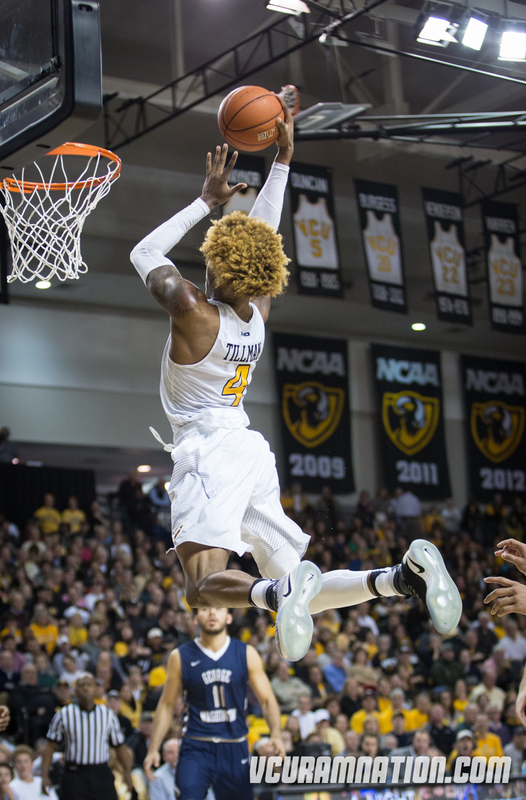 One key to VCU’s four-game win streak? : Improved turnover margin. The Rams averaged 11 turnovers per game these last three, a number somewhat skewed negatively by the 15-turnover performance in VCU’s dramatic overtime win at St. Bonaventure. VCU had just eight turnovers in their earlier win against GW, winning the TO margin battle by nine. The script from the last game between these two sure seemed to work well. The Rams defended the three-ball (that GW tends to live and die by), holding the Colonials to just 2-16 from distance while doing what VCU does best on offense: attack the rim. VCU’s ability to consistently finish their non-stop barrage of close twos puts so much pressure on opposing teams’ offenses, especially teams that rely heavily on finishing low percentage shots. Smart shot selection and sound defense will go a long way toward another road win for the Rams tonight. The Colonials allowed VCU to finish 56.5% of their 46 two-point attempts in the last meeting between these two. That’s almost 10% worse than GW has given up on average this season, meaning another porous defensive performance like that would almost certainly result in another loss for GW. The Colonials need to get that number closer to or below 50% while getting some shots to fall from distance on the other end. That’s been the blueprint for the Colonials two biggest wins this season (UCF and Davidson) and they’ll need to replicate that tonight to beat a tough team like VCU. Kenpom: 73-68 VCU win with a 69% chance of a Rams victory. Game tips at 9PM at the Smith Center in Washington DC. Watch: CBS Sports Network, Official game day headquarters are Baja Bean Co. in the Fan and Buffalo Wild Wings locations at Virginia Center and downtown on Cary Street in Shockoe Bottom.